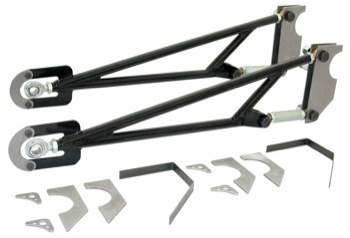 Competition Engineering has designed this Ladder Link with a dual pivoting adjustable lower link. Now you can fine tune the suspension without removing the bar from the car. You can change chassis pre-load and pinion angle by simply loosening the jam nuts on the link and rotating it in the desired direction. Competition Engineering's Ladder Link is different from other ladder bars in that it doesn't create a binding situation when its adjusted. It features high quality spherical rod ends and is constructed of 1 diameter, .156 wall DOM steel tubing and is finished in beautiful black powder coat.